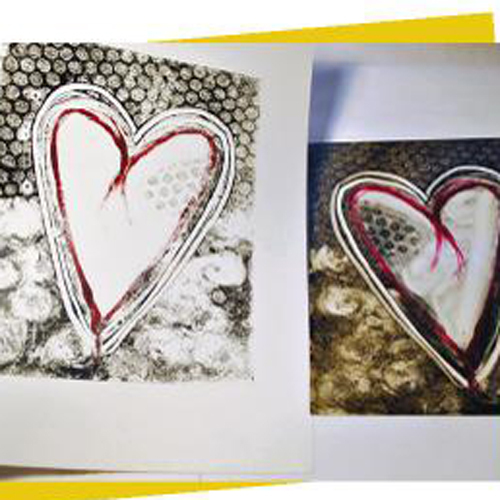 Project Description: Try this monoprinting activity to create your own prints with Grafix products. Roll ink evenly on Grafix inking palette, then ink Grafix Monoprint plate so that an even opaque layer of ink is on surface (I find that black or dark brown provides the most contrast with the white paper). 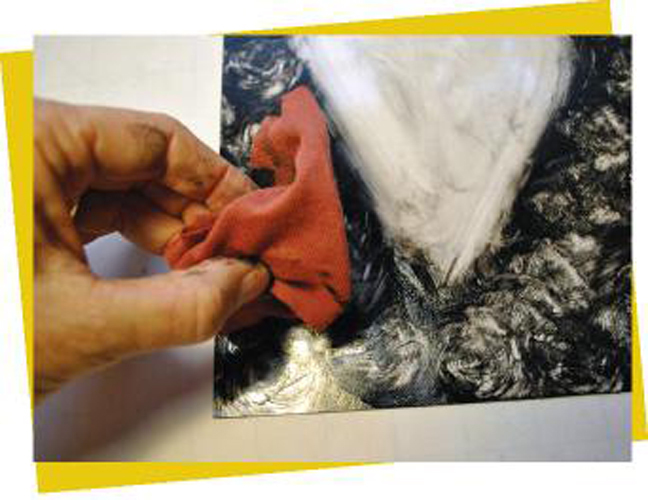 Remove ink (subtractive method) by twisting, wiping and rubbing a small rag or wadded paper towel on inked surface. Use pencil eraser, q-tip or paper stub to subtract thin lines. 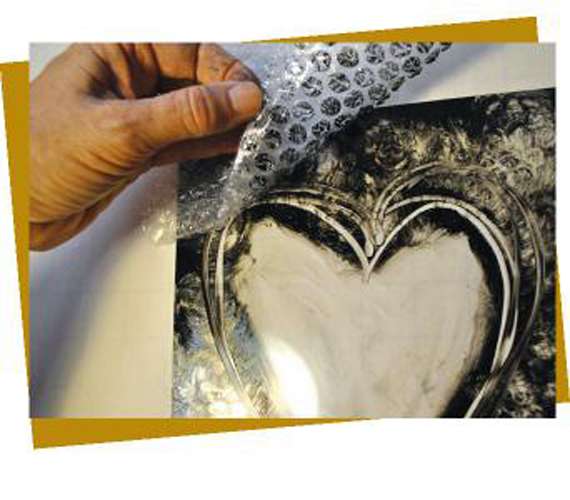 You can remove more ink and add texture by pressing clean bubble wrap or rubber stamp onto inked plate. Now add ink of contrasting color (additive process) by brushing on with stiff bristle brush. Move printing plate to clean surface and place paper face down on plate. Using baren or flat block rub back of paper – apply pressure, making sure entire surface of plate has been rubbed with extra focus on edges. Peel paper back and reveal print. Set aside on flat clean surface to dry. Before cleaning or re-inking your plate, take a ghost from what ink is left. Lay a piece of tissue or other paper on the plate and gently rub this time with the palm of your hand to lift any remaining ink. Once both the original and ghost print have dried, use matte medium or decoupage to glue tissue ghost over original print or other interesting papers. Add more texture and pattern to prepared plate (steps 1–3), by inking a rubber stamp with contrasting ink, rolling ink onto thin found objects such as netting from a bag of oranges, then lay on plate and rub as before. Don’t like a print? Or it came out too light? Ink up the plate again (steps 1–6), then this time carefully lay the print plate onto first print to line up edges and rub vigorously. For this technique paper collage elements are applied during the print process. Cut printed-paper to desired shape (thin paper ephemera can also be used, ticket stubs, stamps, photos, etc.). 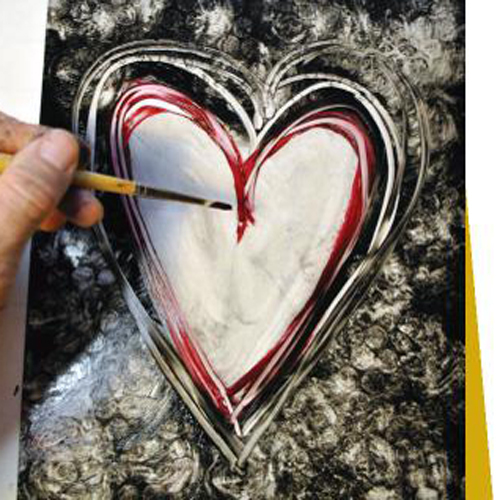 Apply a generous amount of glue to the back of a paper shape. Then lay face down – glue side up – onto prepared printing plate (steps 1–6). Lay paper down as before, rub with baren paying extra attention to place where paper objects are, peel print as before.